[...] I have been asked to put an end to my battle, but I have always refused, even at the risk of my own life. My response has always been the same. I do not want popularity, I do not want positions of power. I only want a place at the feet of Jesus. I want my life, my character, my actions to speak of me and say that I am following Jesus Christ. This desire is so strong in me that I consider myself privileged whenever in my combative effort to help the needy, the poor, the persecuted Christians... Jesus should wish to accept the sacrifice of my life. I want to live for Christ and it is for Him that I want to die. I do not feel any fear in this country. We must never forget that the Jesus we receive in the Eucharist is the same Jesus who gave his life for us. The words of the consecration remind us of this: “This is my body given for you ... This is my blood shed for you.” To receive this food is to be reminded that, like Jesus, we too must be willing to give ourselves in the service of others. Shahbaz Bhatti did understand Jesus’s call clearly. He did not compromise his faith even if he knew he was going to die. The daily, the Sunday Eucharist was for him everything. Jesus filled his heart with fortitude, exceptional courage and patience. Today we look at our parish priests, Extraordinary Ministers of Holy Communion, SVP and Care Ministry members and we wish that all of us would have the same understanding of the Church, of the Eucharist, of Charity as Shahbaz Bhatti had, as people in Kazakhstan had and converts to Catholicism have. Are we willing to place on the altar of the Lord, right here, now, all that we are, our whole selves? I do not want popularity; I do not want positions of power. I only want a place at the feet of Jesus. I want my life, my character, and my actions to speak of me and say that I am following Jesus Christ. 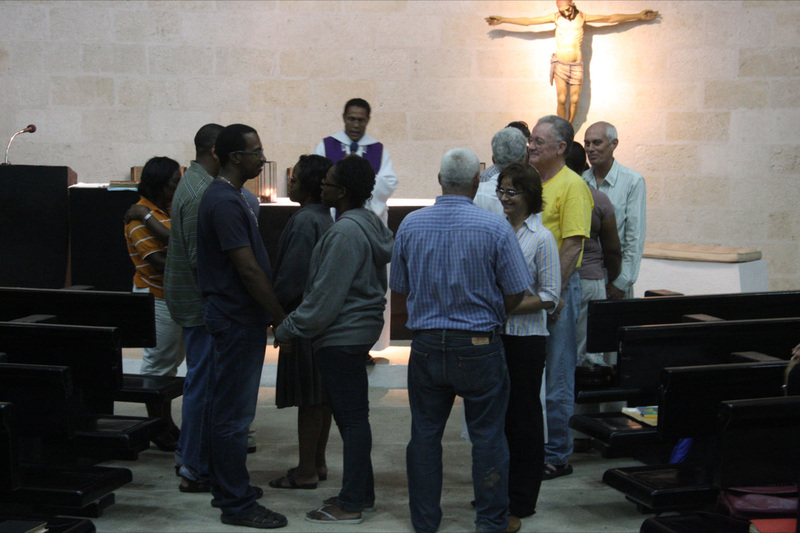 a Lenten Retreat over the weekend 2 – 3 April. We brought in three people from the group “Hard as Nails” from New York, USA. Tim, Raquel and Dave led the teens on an inspiring journey. Many teens were hesitant to come but all (I hope) were glad they came. The retreat was held at Youth with a Mission (WYAM) retreat centre at the old Thicketts Plantation House in St. Phillip. They slept in bunks in cabins. Many parents volunteered and helped with the cooking and clearing up of the meals and with security. The boys enjoyed a mission consisting of a walk and shooting and retrieving golf balls in field. The girls washed one another’s feet and got to know one another better. There was a meaningful time of Adoration of the Blessed Sacrament followed by Confession with Fr. Andy way into the night. Fr Andy said Mass on Sunday morning. He told us that during this retreat a fire had been lit in those of the teens who let it happen, and it would be a challenge to keep it lit. He invited someone to volunteer to hold a lit candle (without anything to catch the falling wax). Liam Cassilly held the lit candle for the entire Mass and realized for himself, and was an example to the rest of us, that it is not easy to keep the fire inside us from going out. It can be painful and tedious – but is worth it in the end. The consensus is that one night on this retreat was not long enough and that waiting until October for the next retreat is too long. The cost of the retreat was covered by parental donations and a carwash which raised $730 at Brighton Farmers Market recently. In the very beginning I knew nothing about the retreat so I had many questions. This is my first year in confirmation class and I was eager to listen and learn from Tim, Dave and Raquel’s experiences getting closer to God. One of the experiences I felt on the retreat was when we had to pray and talk to god. I have never tried to concentrate on something for such a long period of time, and yet it made me complete. It was like some part of me was filled as it had never been before. Afterwards we could go and confess our sins to Father Andy. I felt like I was born anew with vigor and strength, that I had a clean slate after talking and confessing my sins to him. I learned about God, but I also learned about his son Jesus Christ. When Jesus died he not only let us into heaven, but he also died for our sins. If we committed a sin, then we just had to confess our sins and we had sinned no more. Jesus loves us as much as God loves us, no matter what sin we commit he will always forgive us. I want to thank Dave, Tim, Raquel, Father Andy and Mrs. Alison for an amazing experience. …The retreat was good. It was an extremely enjoyable experience and all of the activities were fun. I now have a completely different view on God. I use to think he was just a guy that we were to glorify but I now see he is a ruler who serves us and who we can talk to and he would talk back. There was a time when only God existed. I was but a thought in the mind of God. Then God created me. He created me not for sadness or defeat or anything negative; He created me to share in his life and glory, for I was made in His image and likeness. God created us not because He was lonely but because He is grace. He made each one of us individually. We are individuals, not copies of one another; neither should we desire to be anyone’s copy. We are God’s copy-write. We cannot be copied. Our identity does not depend on who others think we are, but on whom God made us to be: a child of God. Since we are God’s image and likeness we cannot lower God’s standards in us but must aspire for something better and beyond. We must aspire for heaven. God created us to be holy for He is holy and He saw that His creation was very good. We insult Him when we try to like anyone else instead of aspiring to be like Him. We should try to change ourselves only if we are dissatisfied with our relationship with our Creator; who is full of grace and blessings. We likewise should be grace and blessings to others. God breathed in us and gave us life; He is in the business of giving life, therefore murder is wrong. God’s breath in us does not make us children of God, we need to be baptized to become a child of God. God made us in His image and likeness with intellect, control, and will-power the potential to create life. Abortion therefore is wrong. We were made for peace and salvation and though we may suffer, God still leaves in us. He has the power to heal us, or to allow us to suffer for our own good or the good of others for if we are of the same faith our sins affect each other. We are God’s work of art, created to live with Him in heaven as He meant it from the beginning. That is why He sent His Son, Jesus. The glory of God is humans fully alive, our souls and spirit at peace with God. How can one remain peaceful in the midst of trials and tribulations? God gives us His grace and gift of fortitude and we become oblivious to pain and suffering, because we are at rights with God. He is our beginning our continuation and our end. He created us for a mission. What God is has gone into us. His image and likeness in us is destroyed when we sin. Adam and Eve used their free will to yield to temptation and died – was separated from God. God however is in the business of restoration. He wants us to live a life of fullness, a life that makes a statement to the world: that God lives in us. So when the appointed time arrived, God sent His Son. His Son’s death enabled us to be adopted back into God’s family. We are temples of the Holy Spirit and children of God and being children of God we have a mission. Knowing that as Christian we have power within us that comes from on high, we step out in faith to be the missionaries we are called to be, confident that with God as our Father, He will defend us. Baptism makes us Gods children and the seal of the Holy Spirit we receive in the sacrament authenticates our union with God. The second stage of baptism is our response. We must respond to the life of grace God has given us by being missionaries. God has made us stewards of His grace so we must give up the old way of life. When we backslide God is patient; He does not want so to be lost, He wants to bring us to fruition; to live the life He intended us to have from the beginning. For even before we were born God consecrated us, it is unlikely therefore that He will now reject us. Jesus death restored our divine life and as He was anointed priest, prophet and king we too are anointed as such. The relationship journey with God begins on earth. That union is never completely severed for God supplies us with the grace that enables us to rise again. He knows what we are and He is not unmoved when His children are in pain. It is imperative that we nourish our relationship with God by prayer, sacrifice, spending time with him and doing good works. Building relationships requires perseverance. Humans can share intimacy, some married couples grow closer and closer as the years go by. How much more can God share intimacy with us! He lives in us and we in Him and so we make sacrifices to deepen out union and attain the God’s glory for it is the reason he made us: intimacy with Him here on earth and eventually in heaven. Some marriages unfortunately break up, but God never breaks up with us. He keeps giving us grace to return to Him when we sever our union by our unfaithfulness. To remain in God there is a condition: keeping His commandments. When we obey it is as Paul says, “I live not with our own life but with the life of Christ who lives in me.” If we live that way we can be confident that at the end of our lives we will hear God say: “Well done good and faithful servant.” We will hear those words only by remaining in Christ and becoming like Him, for separated from Him we can do nothing good. Becoming like Christ but not happen automatically. It comes by prayer. Holiness is living righteously, in tune with God, in fullness of life. If we remain in His love we tells us we may ask what we will and we will get it. That is because our prayers will not be selfish ones but will be directed by the Holy Spirit and in accordance with God’s will for us. If we are in union with God we cannot hate anyone, we have to forgive. Union with God is what will make us citizens of heaven, where God intends us to live with Him forever. We are children of light; we are children of God; union is our destination. Amen. I am greatly privileged and humbly honoured to have been asked to extend a vote of thanks on this occasion of “Our Journey from Earth to Glory Retreat”. On Monday the topic was “from nothing to creature”, on Tuesday it was “from creature to Christian” and tonight it was “from Christian to union”. In dealing with these topics, Fr. Elveau taught us things about ourselves and fundamental aspects of our Christian faith in a very charismatic manner, yet simple and humble. We were reminded that man is not here on earth by chance but was thought of before creation and before life was breathed into his nostril, in short before God performed the first CPR. Most of all, we were created in the image of God. He explained in a very eloquent manner, with quotations from the holy bible, why it is correct to baptize babies. We are consecrated before birth. We have been advised to make a sacrifice now for the glory of the future. We should aspire to remain in love of God and remain in union with Him by keeping His commandments. We must be intimate with Christ to inherit our place in heaven. Brothers and sisters, I am sure that we are all more enlightened because of this retreat. Fr. Elveau was introduced to us as a pastor and retreat master – he is certainly deserving of these titles. We would like to thank all those who in any way helped to make this Retreat a success. We also thank you, the audience, for your attendance. Fr. Elveau, I, on behalf of Fr. Luke, Fr. Andy, St. Dominics parishioners and visitors, wish to thank you for the profound and enlightening message you brought us. Christmas day is approaching and traditionally I would like to wish you on behalf of the Pallottine Priests, and as your pastor, a Blessed Christmas. This year I would like to emphasise the word “blessing”. The blessing, peace and “to be right with God” is much more important than anything else, not only during the Christmas season but also in every moment of our lives. May Jesus bring you and your family blessing and peace for this Christmas season and for the whole New Year 2011. I would like to encourage you “to line to Jesus”, to his manager for His special blessing. We would like to surprise you this year with the new design of the crib, with a souvenir for each family and with a lovely musical message. Please join us at our Christmas celebrations. I pray that this Christmas will be special and memorable for you. You may photograph this time and participate in our Community photograph with our exceptional Christmas crib and Christmas decorations in the background. I enjoy the third Christmas in Barbados and I am again and again amazed by the warmth of the Caribbean hearts. There is a variety of hearts from the entire Caribbean region in St. Dominic’s, and from all over the world. In this diversity is our beauty and strength. Thank you for being a part of the St. Dominic’s Community, for your efforts and commitment, sympathy or even for one visit. Every year we are becoming a better Christian and Catholic community. I never felt as a stranger among you. Thank you for your hospitality and acceptance, especially for forgiveness, if we priests are sometimes making human mistakes. I pray also for those who do not accept us and judge us unjustly and I extend a hand full of love and mercy to them. Come and join us in our effort to build a Community of understanding, tolerance and forgiveness. 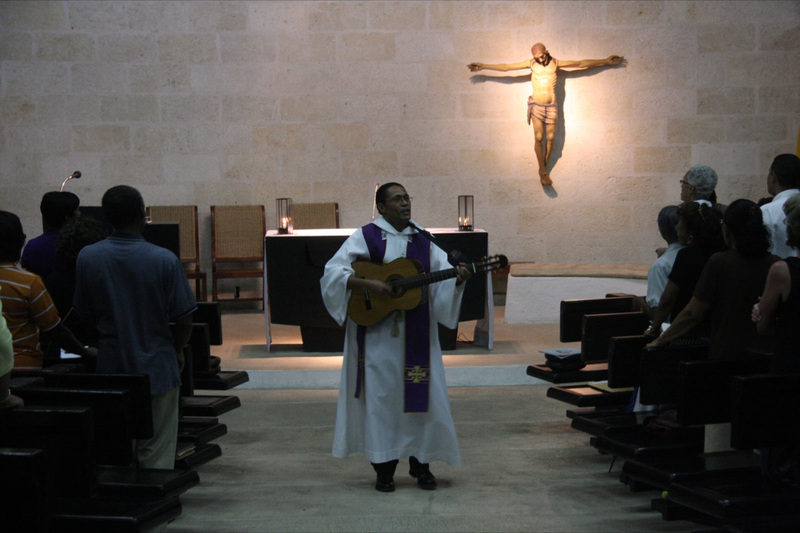 I am a missionary priest, Barbados is now my home, and I am happy to be here. And I repeat again, whatever is good in my Polish heart, I give to you. Please accept “The Good News” I preach to you as your pastor and shepherd. All of you are precious to me. As you remember, the sick and home bound parishioners have always had an important place in my heart. It was a special time when I visited them before this Christmas at their homes. To stress more how important they are in our Community I asked one of our senior parishioners Mr Warren Alleyne, 86 year old, war veteran, national historian and devout catholic to share with me this Christmas message. First Mr. Alleyne, when I visited him, showed me his chain cross from Bethlehem where he was in 1964. He visited the place where we Christians believe Jesus was born, and put his hand on the Nativity Star. On his behalf he would like to wish everybody peace and fear of God. We live in a blessed country but we need to have greater faith, said Mr. Alleyne. We must be also grateful for everything we have received from God’s hand so far, especially an education system and health care. Mr. Warren was very close to polish officers and he keeps good memories from that time. He doesn’t’ speak the Polish language but he has valuable memorabilia and knows some historical details I do not even remember. 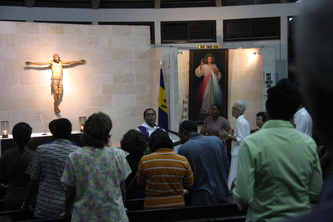 Let us say then together with Mr. Alleyne: Have a Blessed Christmas and a Happy New Year 2011! In response to Fr. Luke’s invitation, Sr. Frances Nosbisch arrived from St. Lucia and the1st Catholic Formation session ‘Who are we as Catholics’, was held on the evening of Sep. 30th. Sr. said that other denominations sometimes had the tendency to label us. They do not know what we are all about but that does not stop them from projecting a false image. She urged us not to accept this erroneous representation but to continue growing in our religion, so as to strengthen our Catholic identity. Together we went through a list of some of the things that identified us as Catholics and she expanded on each one: The Eucharist, Liturgy and the Sacraments; Mary and the rosary; the unbroken line of succession: our popes going all the way back to Peter, the first pope, and Christ. We are so very privileged she said, to have such a wealth of tradition and history that no other denomination has. When it is misrepresented by other denominations, we should be able to defend and explain it to those who, not understanding, distort it. To be able to do this requires continued education and growth for there is no end to what we can learn about our faith. The 2nd Session: ‘Building and Strengthening our Catholic Identity’. Catechetic, Sr. Frances explained, was putting others in touch with God. Some had the false belief that catechetics was for children, that adults had passed that stage. We can never pass that stage Sr. stated, for Catechetics is the means by which we grow and growth is an ongoing process. We can never reach the point where we have learnt everything there is to learn. The bible and the lives of the saints are tools that can assist in bringing others in touch with God. Our own experience is also another way. However before we can bring others in touch with God, we have to be in touch with God ourselves. We acquire knowledge and it strengthens our Catholic identity. By using our knowledge formation takes place; formation is the art of putting our knowledge into practice. Formation leads to commitment; we are all expected to commit to our faith. Commitment leads to mission. Our mission is the same mission to which Christ commissioned His disciples: spreading the Good News of the Gospels. What we are expected to do is tell others how it happened to us; how God is working in our lives. We are called to be holy, Sr. Frances said, to be as Christ-like as is possible. We are called to help others to be the best they can be. We are called to take care of creation; to practice justice and right relationship. We are called to good communication with God in prayer. The 3rd Session: ‘Response to God’s Gifts’. It is our responsibility to call, support and challenge each other to grow, Sr. assured us. There is good in everyone and we are to try to bring it forth. We should try to develop an ease in asking what God has done in a person’s life and may even become the key person to encourage another into doing exactly what God wants them to do, for commitment can be contagious. We simply invite someone to participate and our invitation and obvious commitment to our religion may jolt them into becoming involved in exactly what God wants them to be involved in. There are adults who live their faith and desire to deepen their knowledge and friendship with God while there are others who have not grown in their faith. The responsibility of adult catchists is to bring others to a deepening of their faith. Just as a parent is happy to see their children grow and mature into responsible adults, so too is God, when His children do the same. We need not despair when we are in crisis for God is working in our lives during such times. It is usually the difficulties and trials that strengthen us. Being human with the usual flaws and weaknesses, we may not always do our best; what is more important is our continued growth. The 4th Session: The different groups and Ministries went off in groups for evaluation and discussion. The Pencil Maker took the pencil aside just before putting him into the box. There are 5 things you need to know, he told the pencil, before I send you out into the world. Always remember them and never forget, and you will become the best pencil you can be. One: You will be able to do many great things, but only if you allow yourself to be held in Someone's hand. Two: You will experience a painful sharpening from time to time, but you will need it, to become a better pencil. Three: You will be able to correct mistakes you will make. Four: The most important part of you will always be what is inside. And Five: On every surface you are used on, you must leave your mark. No matter what the condition, you must continue to write. The pencil understood and promised to remember, and went into the box with purpose in its heart. Now replacing the place of the pencil with you; always remember these 5 things and never forget, and you will become the best person you can be. One: You will be able to do many great things, but only if you allow yourself to be held in God's hand. And allow other human beings to access you for the many gifts you possess. Two: You will experience a painful sharpening from time to time, by going through various problems, but you will need it to become a stronger person. Three: You will be able to correct mistakes you might make or grow through them. Four: The most important part of you will always be what is on the inside. And Five: On every surface you walk, you must leave your mark. No matter what the situation, you must continue to serve God in everything. Let us be pencils, instruments, servants in God’s hand. Maybe from among us God will call a new St. Francis who will one day enkindle the power of God’s love in our hearts, so we would reveal it to the world, to transform the world, to renew the Church. We need a new St. Francis. Check your mailbox, maybe God’s invitation is already there. Righteousness, peace and joy in the Holy Spirit. It was the Theme of the Lenten retreat which Fr Irenaeus preached at St. Dominic’s. 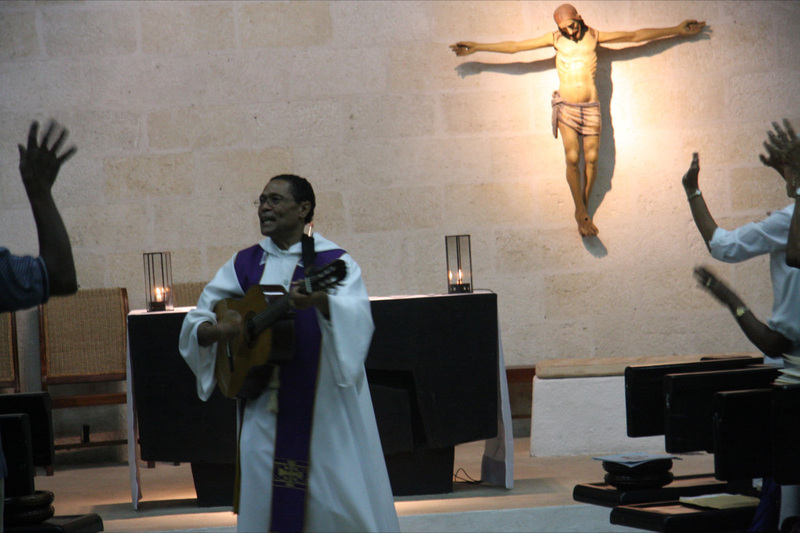 He came up from Grenada full of joy in the Holy Spirit, breaking out into song as is his habit, sprinkling his talks with jokes and testimonies from his parish life. Sin deprives us of the righteousness, peace and joy of the Holy Spirit he warned. It is the only thing which can separate us from God, while the only way to serve God is by living righteous lives. Being members of various church groups does not necessarily mean that we are serving God; it may help us to do so, but if we are attending mass and no change is taking place in our lives, then we are deceiving ourselves. He mentioned the three agents of deceit: (1) Satan (2) Sin (3) Self. Satan presents himself as one who can make us see clearly. He conned Adam and Eve into believing God didn’t want them eating of the forbidden fruit because He knew that should they eat they would become like Gods. Adam and Eve fell for his lie and only see what became of it. Satan always has a better way, so he would like us to believe, and if we are not listening to God’s views, then we align ourselves to the views of Satan and the world. Sin is always in competition with the word of God and we must beware, for sin causes us distress. Obedience, on the other hand brings us blessings. The devil never comes to us when we are committing sin; it is when we are striving to live righteous lives that he comes with his temptations. As for self, the third agent of deception, Father urged us to choose to act as the Christians we say we are. The devil never tells us of the consequences of what he’s tempting us to do, but when we give in to his temptations, we reap what we sow. 1. Natural Expectations: If others continue to show us who they are we should believe them. 2. Sinful expectations: When Paul was arrested by the Jews, Felix was hoping Paul would pay him moneys, so that he, Felix, would let him go free. 3. Impossible expectation: As in the case of Abraham where he was promised by God that he would be the father of nations, though he was over a hundred years and his wife almost as old, plus being barren. We need to ditch pride and work with what we have, making the best of ourselves so as to be confident. We should be confident that God will provide us with lasting joy as we make our mark as His witnesses, until He calls us home. His directions are more important than what people say or think, therefore we should make sure that our attitude to life is similar to Jesus’ attitude and compare ourselves not to others, but to Jesus. Ignoring God’s directions is a bad idea which tends to get us in trouble plus, ignoring God’s directions will leave us lacking His gift of joy. The good news is, we do not have to continue living lives in opposition to Christ’s example, we can immediately begin striving be able to stand with confidence before the Son of God. 1. Interested in God’s word so as not to be easily swayed by emotions and desires. 2. Love and appreciate those around us especially members of our family. 4. You cannot do evil to accomplish good. God wants to guide and enable us to live righteous lives. He wants to enable us to live lives of peace and joy. All in all the retreat was not only informative, but also entertaining. Father Irenaeus talks were appreciated and enjoyed by all, leaving us spiritually richer for having attended the retreat. [...] This year we are invited by the shepherd of our Catholic Church in Barbados, archbishop Rivas to stop and reflect on our Church. We celebrate the Assembly 2010. The Assembly is simply a time for discussions and learning what we as a Diocese have to improve to better answer the mission Jesus has entrusted to us. We expect to come to constructive conclusions and resolutions. In this way, we will support our bishop and priests to continue their guiding mission. The Assembly 2010 has different phases and is stretched out over a period of one year , to make sure that everybody can addresses his concerns and participate. The coordination committee is the core of the assembly. Its role is to make sure that the process of the Assembly unfolds according to the schedule. The committee gathers, analyzes and communicates information. The committee is a small representative group with archbishop as its head. The committee meets frequently. Another much bigger representative body is the gathering of delegates. Each parish community, diocesan organization has one or more representative. The gathering of delegates met at the beginning of the Assembly 2010 to help Archbishop to set the theme, goal and objectives for the Assembly. Next time delegates will come to analyze and discus the results of our local assemblies, also called parish assemblies. The parish community is the basic unit in the body of the local Church. The Church is built on parishes. Within this frame are acting diocesan organizations, existing catholic congregations, communities, groups, schools, hospitals. For the Diocesan Assembly the parish assembly is the fundamental and the most important stage of discussion. The parish assembly must be planned deliberately. We have decided to celebrate our assembly in a very special form. As I informed you already on Sunday 18th April we will have only one Holy Eucharist for the parishioners and visitors. This celebration will symbolise our unity. After the liturgy we will share a breakfast and then we will start the debate. I would like to emphasise that we invite also our visitors to share the assembly with us. As I mentioned our discussions are channelled by the theme of the Assembly. The theme represents the cry and desire of the majority of the assembly delegates: “One Church our mission, disciples united, active and alive”. Please note the accent on unity in the Church. Our goal is to rediscover our Catholic identity, to renew our local Church in Barbados. Although we have some frames for our parish assembly please feel free to come with every question and topic to discuss. We will use the small group method to make our work easier, however we expect the debate may take some time. We will do our best to have our meeting properly managed. We expect that we should close the assembly before 2 p.m. We will provide meals: breakfast, drinks, coffee, lunch and care for the children. There will be a special care unit and play ground. It is very important that the entire family take part in the meeting. This is the manifestation of the community and a very unique experience for everyone. I would like to make a special appeal today. Please accept our invitation to help us to organize the assembly. We will be asking parishioners to do some presentations at the meeting. Please plan for you and for your family free time on the Assembly Sunday. Remember the story of the echo effect. Whatever you offer to the Church this will profit for you and for generations. Make sure that your name, and the names of your family will be listed in the assembly directory. There will be a list availably at the entrance this Sunday, ask Catherine Smith or our ushers. We need to know how many participants we have to cater for. The logistics for such a big community as St. Dominic’s is a big challenge. There will be also more lists for volunteers who can offer their help at the assembly in ushering, the kitchen and technical support. Please read announcements for more details. Most of you probably remember a short video I shared with you a year ago. The video reminded us that time is the gift from God. It is our most precious possession. We can waste it or we can invest it in the Kingdom of God. When you watch this video again today, please answer the question how have you invested your time. If you have read, our Christmas parish bulletin you would notice a column entitled “It happened in 2009”. It is only the summary of what we as a community have done with our time in the year 2009. The list is very long. There are many names of those who helped to prepare each event and those who participated. You can look at our website photo gallery and recall those most important moments and people who made them happen. Do you remember St. Dominic’s Feast and the Fun Day, it was a lot of joy for everyone and the common celebration with our sisters and brothers from Black Rock, do you remember St. Francis’ day and the blessing of our pets, Stations of the Cross, confirmation ... We had a task force, a group of people who were always ready to help, but each time we also had more and more new parishioners coming and offering their support. We did so much together for our community and for others. We have invested our time the best we could. We have been building God’s Kingdom here on earth. We have been building the community, the Church, the rock to resist any disaster and turmoil, a shelter for all of us. We were united by love around this church around this altar, around our Lord Jesus Christ. We had a spectacular conclusion for the year 2009. It was the launching of the care ministry. I was amazed at the sight of so many of you coming to help. Of course, every year we support many charities but there is something different when you yourself cook, pack and distribute the food to those in need less fortunate. I would like to proclaim the care ministry as the biggest success of our community for the year 2009. And I guess that the ‘soup kitchen’ is only a beginning. Thank you for the care ministry, thank you for your support. I would like to ask you a question. Have you been with us this passing year? Did you participate to build our Church and our Community? No, not yet? Please do not worry. There is the whole New Year 2010 full of new time to invest. 365 days full of new challenges. There is one special challenge and dream to realize. We hope to celebrate next Christmas in the new parish hall. We wait for the tender to be analyzed. Soon we will be able to choose the contractor and to start the building. When I look at the 2009 calendar and at what we have done already I can only say: ‘yes we can’ and we will do it. United, together with Christ we will build our Church. Nothing will stop us. What do we see when we look at the manger. We see happy people. There is a happy mother Mary and a happy father Joseph, happy shepherds and happy wise men who finally after a long journey reached their desired destination. There is the baby Jesus in the centre of the scene. I believe little Jesus was very beautiful, like every baby. But we look also at the odd gifts brought by visitors and suddenly our hearts start to worry. What kind of future do those gifts indicate: gold myrrh and incense? Today we celebrate our Lords Epiphany. Epiphany means a revelation. This feast reveals the true meaning of Christmas. It answers a simple question: why was Jesus born as man like us? I would like you to listen to the story of a beautiful heart. One day a young man was standing in the middle of the town proclaiming that he had the most beautiful heart in the whole valley. A large crowd gathered and they all admired his heart for it was perfect. There was not a mark in it. Yes, they all agreed it truly was the most beautiful heart they had ever seen. The young man was very proud and boasted more loudly about his beautiful heart. Suddenly, an old man appeared at the front of the crowd and said "your heart is not beautiful as mine." The crowd and the young man looked at the old man's heart. It was beating strongly, but full of scars, it had places where pieces had been removed and other pieces put in, but they didn't fit quite right and there were several jagged edges. In fact, in some places there were deep holes where some pieces were missing. The people stared - how can he say his heart is more beautiful, they thought? The young man looked at the old man's heart and saw its state and laughed. "You must be joking," he said. "Compare your heart with mine, mine is perfect and yours is a mess of scars and tears." "Yes," said the old man, "Yours is perfect looking but I would never trade with you. You see, my every scar represents a person to whom I have given my love - I tear out a piece of my heart and give it to them, and often they give me a piece of their heart which fits into the empty place in my heart, but because the pieces aren't exact, I have some rough edges, which I cherish, because they remind me of the love we shared. Sometimes I have given pieces of my heart away, and the other person hasn't returned a piece of his heart to me. These are the empty holes. Although these holes are painful, they stay open, reminding me of the love I have for these people too, and I hope someday they may return and fill the space I have waiting. So now do you see what true beauty is?" The young man stood silently with tears running down his cheeks. He walked up to the old man, reached into his perfect young and beautiful heart, and ripped a piece out. He offered it to the old man with trembling hands. The old man took his offering, placed it in his heart and then took a piece from his old scarred heart and placed it in the wound in the young man's heart. It fit, but not perfectly, as there were some jagged edges. Do not be afraid to admit scars and holes in your heart. It gives you the beauty and value. How sad it must be to go through life with a whole untouched heart. You see, the Christmas story is all about the heart. God gave us his Son. He made a big hole in his heart. But He was prompted by love. He wanted our hearts to be beautiful and he wanted us to be happy. Gifts brought to the manger by wise men indicate the true meaning of Christmas. When you look at the Christmas decorations, they are not important, simply delete the Christmas tree, erase the decorations and lights, no Christmas carols, no gifts, no tears ... today we see only Jesus’ heart beating for you. Today His heart is very small, but soon will be big enough to be sacrificed in order to give you eternal life.